Because our climate is generally damp we forget that during hard frosts the moisture is quickly taken out of the air. 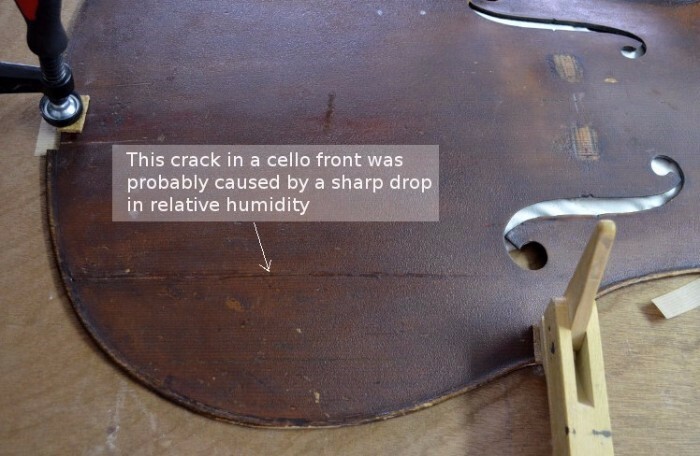 The resulting dry atmosphere can cause shrinkage in wooden instruments. Given time to acclimate, instruments can withstand both dry and humid environments but it is the quick changes that invite trouble. Violin family instruments are made of different woods glued together with the ribs having their grain running in a different direction to the front and back. These factors of material conflict and strong movement obviously create stress. The good news is that there are a number of measures that you can take to protect your instrument from sudden changes in humidity. Check a weather website for external humidity (as internal humidity of a house usually matches external humidity). 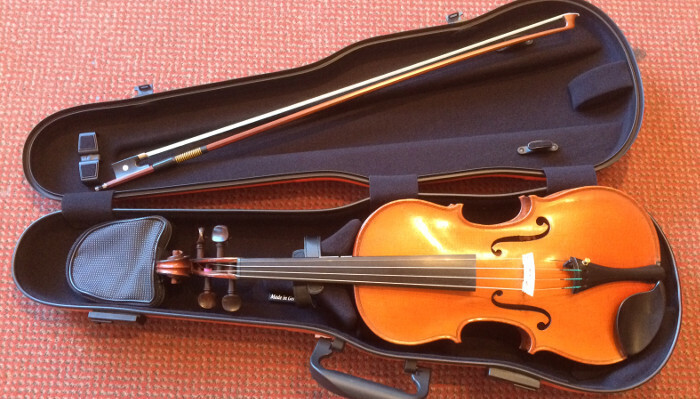 Make sure your instrument is in a well designed case that will slow down the changes between humidity inside and outside the case. We have some in stock so please enquire if you would advice on them. Some have humidity meters in them but unfortunately they are often inaccurate. The best indicator is perhaps whether your own skin feels dry. 2.Keep your instrument in a room which is as atmospherically stable as possible and not too dry eg north facing room with no heating. If your home is very dry consider using a humidifier in the room where you keep your instrument. We recommend Ultrasonic mist humidifiers that create steam at a low temperature (available from shops like Argos) or humidifiers that hang over a radiator. If possible insert an internal humidifier inside the instrument where the unvarnished side of the wood can absorb the moisture. We recommend Dampit humidifiers which hang inside an instrument. There are also cheaper Paganini or Trophy alternatives. Planet Waves make some interesting case humidifiers. Available from us or online. Some people also recommend keeping instruments in silk or tightly woven cotton bags to slow down the transfer of humidity. Synthetics don’t have the same effect. And while we’re on the subject of instrument maintenance, don’t forget Lyris Hung’s advice from D’Addario Orchestral Strings: wipe your strings clean every time you play with a lint free cloth or even a paper towel. Do not clean strings with any solvents as this turns the rosin residue into a solution that travels into the core of the string and will dramatically shorten the life of the strings. Rosin is abrasive and one of the main reasons that strings wear out.